I grew up with dogs and cats for pets. Around jr high through high school we also added geese, chickens, pigs, and horses. There was always something fluffy to pet or hold. I can't imagine what it would be like to be a kid without a furry best friend! We had two kitties when Nathan was born. One was my cat Bruce who was my first pet as an adult. I adopted him after Mike proposed and then left on a touring production of Pocahontas. I had no way of knowing that Michael was allergic! It was not the best reunion when he came home from the tour with puffy red eyes and loud wheezing. In the interest of domestic tranquility, Michael got allergy shots and I kept Bruce. Somehow we ended up with a second kitty, Jackie, whose function was to keep Bruce company since he seemed lethargic and depressed and the vet recommended it. Jackie was one generation away from being feral and only antagonized Bruce. Ironically, she loved Mike, who couldn't so much as touch her without his eyes swelling up. She also loved baby Nathan and was constantly near him. Shortly after Nathan's birth we moved to Japan, sans felines. When we returned and reclaimed them from my parents, Bruce was more than just lethargic. There was something seriously wrong with him and we lost him shortly after that. It was terrible for me and in the wake of mourning for this cat I declared we would have no more pets... it's too hard to lose them! Jackie became downright wild and we found out we were expecting Benjamin and I could no longer take care of the litter and such due to a complication with the pregnancy. We found Jackie a happy home with lots of other kitties. Since then, the only pets we've had have been two Betta fish. Nathan's was named Scruffy and he died about a month after we got him. It was a sad day for our first born and we held a fish funeral and buried him in a shiny paper jewelry box. Benjamin's fish, Tuna, has managed to survive a couple of years despite the lack of regular food and fresh Betta water. He is stubborn, I guess. We'll have to find him a new home soon as we can't take him to Macau. In the meantime, Nathan has tried every argument possible to convince us to get a pet that has four legs. But our history of 12 moves in 13 years and the back and forth out of the country relocations just don't make it easy to own and care for a pet. 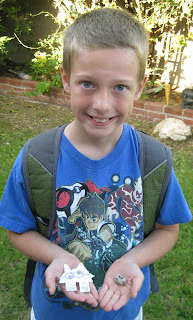 Nathan recently took matters in his own hands and brought home from school a carefully wrapped package. I was fearful when he gently handed it to me and said to open it. Inside I found his perfect pet: A rock. 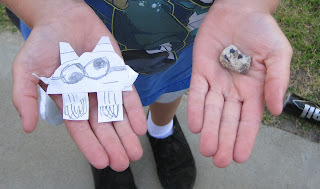 He has carried Mr. Rock with him everywhere, sleeps with it at night, and has even started making action figures of the rock and is writing stories about it. Did I mention he has a wild imagination? I hate to deprive my kids of the joy and responsibility that comes with pet ownership but until we settle somewhere for more than a year and actually own instead of rent I don't think it will be in their future. Mr. Rock and his "Jet Pack" action figure. I would have been fearful to open the package also. As a mom of boys you never know what they're bringing in the house. Glad to hear he's happy with his new pet!